Why Choose A Watermelon Centerpiece For Your Wedding? Dazzle your guests with a Watermelon Centerpiece. You'll be the talk of the town! Not only are they unusual and festive to look at, they also are edible and make a fabulous conversation starter. 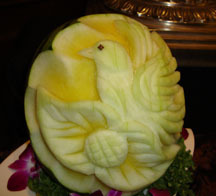 The art of carving food is an Eastern custom and the stunning design that you create will be the focal point of your table arrangement. I’m thinking you’ll be too busy preparing for your wedding, so you’ll need to elicit the help of your friends and family to create your fabulous fruit table arrangements. Whoever is helping you prepare the watermelon centerpiece should try making the centerpiece about one month before your wedding. This will give you plenty of time to practice, make changes and gather new ideas. Place the large towel on your work station and the watermelon on top of the towel. (this will gather the juice and keep the watermelon from slipping). Cut about 1/8 to 1/4 inch slice from the bottom of the rind to create a stable base. Draw a line with the marker on the top 1/3 of the melon lengthwise, leaving about 2/3 of the melon on the bottom. For an interesting look, cut a wavy or saw tooth pattern into the melon. Use the vegetable peeler to smooth away any rough edges. Scoop out the flesh from the watermelon using the melon scoop. Cut up cantaloupe, honeydew, pineapple and kiwi using the melon scoop or cookie cutters to create different shapes. Then add strawberries, blueberries, raspberries, blackberries, red and green grapes and whatever other fruit you desire. Place the watermelon on a platter and decorate the bottom of the watermelon with fruit, curly paper or doily’s. A watermelon centerpiece can be prepared the day before your wedding; remember that you will need plenty of refrigerator space to store your arrangements. One bride that I know had the fruit cut into heart shapes while another bride used star shaped fruit. Your design is limited only by your creativity and imagination. 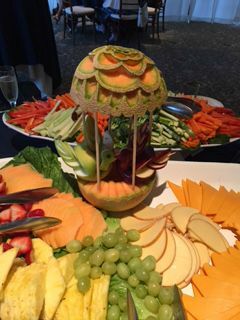 The above was a fruit and cheese station, however notice the melon in the center. 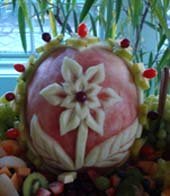 You can create that centerpiece and place fruit around the bottom and add flowers to create a fabulous centerpiece. For more inspiration go to your local library, bookstore or the Internet and view creations of famous chiefs and other talented food preparers. If watermelon is one of your favorite fruits, create a watermelon centerpiece which will be unique and have your guests talking about your wedding reception for a long time. Click on this link to go to my home page for more fabulous ideas.